Nami, N., Lale Mohammadi, S. (2017). One-Pot Facile Synthesis of New 1, 2, 4-‎Triazolidine Derivatives Using Sodium ‎Borohydride and Fe3O4 Magnetic ‎Nanoparticles (MNPs)‎. 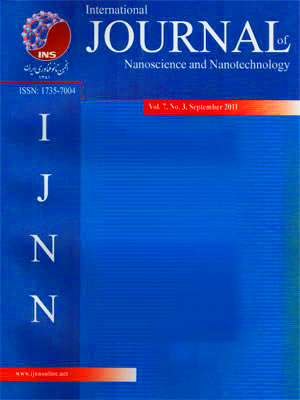 International Journal of Nanoscience and Nanotechnology, 13(4), 347-357. N. Nami; S. Lale Mohammadi. "One-Pot Facile Synthesis of New 1, 2, 4-‎Triazolidine Derivatives Using Sodium ‎Borohydride and Fe3O4 Magnetic ‎Nanoparticles (MNPs)‎". International Journal of Nanoscience and Nanotechnology, 13, 4, 2017, 347-357. Nami, N., Lale Mohammadi, S. (2017). 'One-Pot Facile Synthesis of New 1, 2, 4-‎Triazolidine Derivatives Using Sodium ‎Borohydride and Fe3O4 Magnetic ‎Nanoparticles (MNPs)‎', International Journal of Nanoscience and Nanotechnology, 13(4), pp. 347-357. Nami, N., Lale Mohammadi, S. One-Pot Facile Synthesis of New 1, 2, 4-‎Triazolidine Derivatives Using Sodium ‎Borohydride and Fe3O4 Magnetic ‎Nanoparticles (MNPs)‎. International Journal of Nanoscience and Nanotechnology, 2017; 13(4): 347-357. One-pot reaction of aldehydes with thiosemicarbazide was performed using NaBH4 and Fe3O4 magnetic nanoparticles (MNPs). The reaction mixture of thiosemicarbazide and carbonyl compounds was stirred under reflux condition in the present of Fe3O4 MNPs and NaBH4.The optimum amount of Fe3O4 MNPs was 5 mol% in ethanol. The precipitate was appeared immediately to obtain 1,2,4-triazolidine. The reflux continued 20 min after addition of NaBH4 to complete the reaction. 1,2,4-triazolidines were obtained in good to excellent yields. All products were identiﬁed by GC-Mass, NMR, FT-IR spectra and physical data with those of authentic samples. The magnetically recoverable iron oxide nanoparticles are found to be efficient for synthesis of 1,2,4-triazolidine derivatives. The Fe3O4 MNPs were simply recovered by external magnetic field and exhibited exceptionally high catalytic activity in green chemistry and enhanced reaction speed without pollution. Fe3O4 MNPs could be successfully recovered and reuse. This method is easier and less expensive than the other methods.